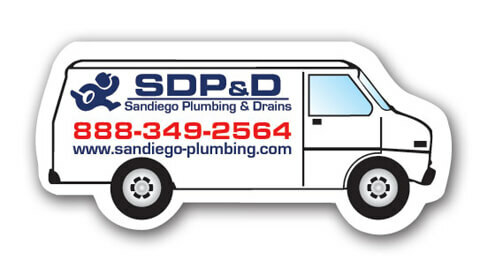 Garbage Disposal Repair and installation Services from SDP&D. Garbage Disposals can become jammed, clogged, rusted, leaking, and become inoperable over time. For the residential home, we recommend the Badger 5 1/2 HP by Insinkerator which is 325.00 installed parts & labor. For the Evolution compact 3/4 HP simply add 100.00. Same goes for the new PRO 750 – 3/4 HP Evolution Model. We make sure the flange is replaced if needed The only real repair that can be done is usually un jamming the unit. Usually if you have a problem with your garbage disposal, its likely it needs replaced. Garbage Disposals come from many different manufactures and have different horsepower but we have found the Insinkerator units are the best quality for the cost. The Garbage Disposal being a kitchen appliance used to grind and virtually liquefies the food before allowing the food to flow through the waste drains into the sewage system. The disposal unit is located under the sink and is connected to the waste line and may also be connected to the dishwasher. Installing a new garbage disposer to a sink is a matter of attaching the disposer to a mounting ring at the bottom of the drain flange and hooking the unit up to the drain pipes. Most new garbage disposers come with the power cord attached so it can be plugged into the electrical outlet when the installation is complete. Installing the garbage disposal Repair or installation is a job that can be done in about an hour.